We have our limits. She’s only allowed so much screen time a day, no community play whatsoever, and any videos must be watched on the Mineflix app. If you ask my daughter why she enjoys this game so much, she’ll tell you it’s because she can build and destroy as she pleases. Hours are spent making houses, brick dinosaurs, and roller coasters. She can breed animals or kill them all off with a touch of her finger. If she isn’t in the mood to survive zombies and creepers, she keeps it in creative mode. I have a resting skeptical mommy face, and that’s what I wore as I tried to remember Cordeiro is also trying to market his book. The best way to get a parent to buy something is to tell them it’s also educational. Yet, even after hundreds of hours of play if I handed my daughter the pieces to make a simple circuit, she’d fail miserably. If she had to fight a zombie, I have my doubts she’d be able to tap them to death with her pointer finger. The friend who introduced my daughter to the game also homeschools her son and brought to my attention that some local homeschooling groups are using the game as a teaching tool. Mind you, the statutes in Florida are very relaxed when it comes to homeschooled children. There are no required teacher qualifications for parents. The state requirements boil down to as long as the child learns something about anything in a year, and the parent provides documentation, they can continue to homeschool. Of course, that’s an oversimplified explanation of the statute, and each state is allowed to set their own standards. Like a spreading rash, I couldn’t help but scratch at this tidbit of information. Why Minecraft? And I didn’t want the answer about teaching survival skills. That didn’t work for me. Why not use some form of accredited educational game? Are there such games? Although my friend wasn’t engaged in the program, I sent her back to the local homeschool group to get more information. It turned out the parents were talking about a series of online courses. I still couldn’t let it go. What was I missing? Why would this game be any better than Disney’s new Imagicademy app? I took off my resting skeptical mommy face and dove into some research. What I found was several sites combining community game play with lessons on history and literature. Safe server environments are set up for enrolled students to meet together for discussion groups and building challenges. While the different sites vary in pricing and lesson styles, they all boast one main advantage, and that is the opportunity for students to engage in learning while playing a game they already enjoy and in most cases excel at. 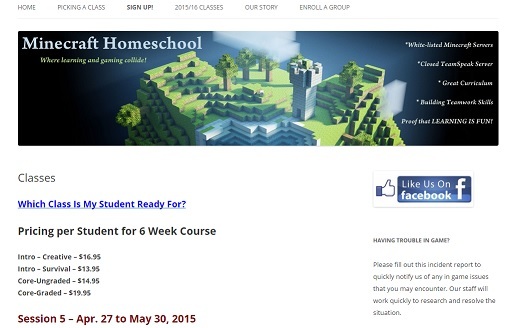 Minecrafthomeschool.com: Jody Nova, owner of Minecraft Homeschool, credits her son with the creation of this homeschooling program. The parent and student are allowed to decide to work in creative or survival mode, and the community server is private. Classes usually run approximately six weeks and can cost between $16.95 to $19.95. Some of the upcoming class titles are “7 Wonders of the Ancient World,” “Master Chef,” and “The Underground Railroad.” What I like about this site is the chart assisting parents with determining if their child should start at the intro or core level depending on reading ability, typing skills, time commitment, and Minecraft experience. HomeschoolwithMinecraft.com: Unlike Minecraft Homeschool, the webmaster of HomeSchool with Minecraft and builder of lesson plans is a little difficult to determine from clicking through the web pages. 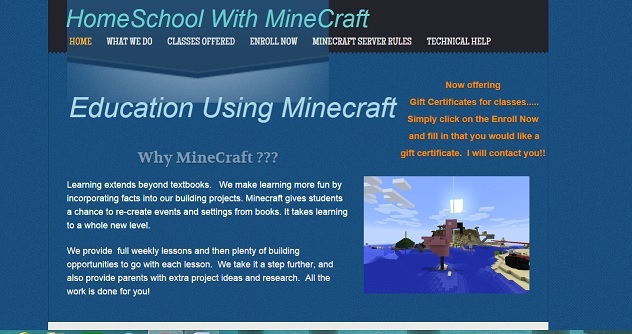 Homeschool with Minecraft courses run about four to twelve weeks and can cost between $6.99 to $15.00 and also use a private secure server for students to meet. Parents can choose for quizzes to be graded and certificates of completion provided depending on state requirements. A few of the self-paced classes offered are “Building with Dr. Who,” “Where in the World is Carmen Sandiego,” and “Famous American Women.” What I like about this site is the offer of the free Monthly Builders Club. SKrafty Homeschool Minecraft: Skraft Homeschool Minecraft has two parts: a full featured gaming server and an online educational site which integrates the lessons with Minecraft. This site appears to be Christian faith based. The servers and chats are moderated by parents. The classes can run from six to sixteen weeks and cost between $6.99 and $15.99. Parents can sign their kids up for individual classes or use a subscription for all classes. Some of the class titles are “Exploring Fractions,” “All About Plants,” and “Inventions and Technology.” What I like most about this site is an optional Chores Rewards System. For an additional $2.99 a month, your child can submit chore forms and receive codes to use in the chore cave. A big drawback and total stop to my further investigation of these lessons was the need for Minecraft on the PC. This is the only device in my house where I refuse to share time with my kids; however, I was able to view a lesson sample on one of the sites, and it didn’t appear to be anything I couldn’t pull from online resources and piece together. For example, I could print out a section about Viking history, read it with my daughter, and then challenge her to build a Viking ship replica. For busy parents who’d like to skip the step of researching and preparing their own lessons, I can see the appeal of having everything in one place already done for them. The Minecraft for homeschooling sites have me convinced that they’ve created an engaging atmosphere for kids to expand their self-paced learning of history and literature. They’ve even given me a few ideas for how to keep my daughter in learning mode during the summer. I won’t ever agree that Minecraft truly teaches survival skills, and I don’t think this is something that will be presented at the state or county level and used in conjunction with core curriculum for school children any time soon. But, I do believe that we live in a world of never say never.